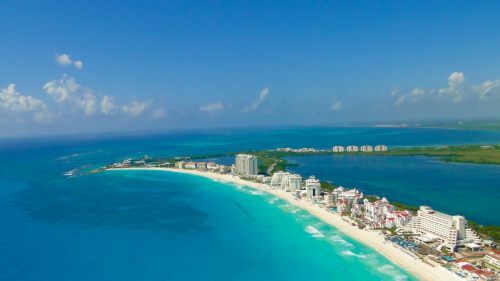 United Airlines has dropped the price of their flights from Calgary to Cancun, Mexico down to $332 CAD roundtrip including taxes on a large number of dates between October 2018 and February 2019. The flights have 1 stop each way. The best stopover lengths seem to be around 90 minutes to 2 hours in Houston. As of 8:50 AM MST - Dec 31 to Jan 9 is showing 1 seat being available. Update 4/15 - Flights from Calgary to Cancun have returned today for $340 CAD roundtrip including taxes. There are now dates available as far away as early March 2019. Update 5/24 - Flights from Calgary to Cancun, Mexico are available again for $347 CAD roundtrip including taxes on certain dates in January, February, and March 2019. - Look for the dates that are $348 roundtrip. calgary, yyc, flight deals, mexico, cancun, cun, united airlines and north america. 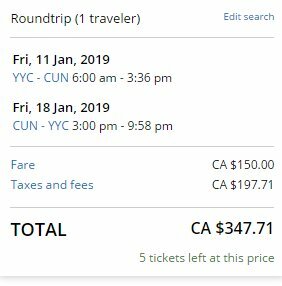 One Response to "Calgary to Cancun, Mexico - $307 to $347 CAD roundtrip including taxes | late fall and winter travel"
Hi Chris, We just want to thank you for all you do for travller like us to find the best deal across, we just booked flight to Cancun for family, thanks a ton, cheers!